How much do you know about Moe Attallah? Photo by Al Goyette. Moe Atallah retired a year ago. Two years ago, close friend and journalist Earl McRae, passed away. Atallah closed the Newport Restaurant at the corner of Richmond and Churchill and operates his business together with his wife and daughter at the smaller venue (formerly Donna’s Restaurant) at Churchill and Scott. Atallah has slowed down, a little. 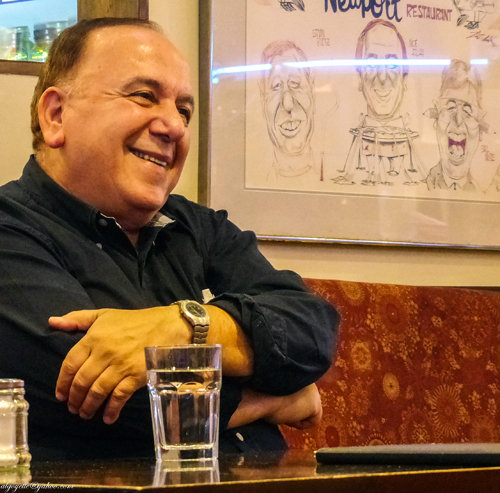 Do a Google search for Moe Atallah and up comes an entry in Wikipedia about the Newport Restaurant, Atallah’s philanthropic endeavours, his involvement in creating a smoke-free restaurant environment in Ottawa. 5. He’s all about giving. “I remember the first time at the Newport for Christmas. You can’t describe the joy it gives when you can make people happy. There are people who came who never eat in a restaurant,” says Attalah.